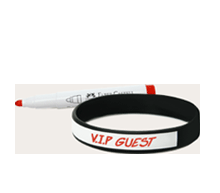 Start building your custom wristbands today with our specialized online builder. This easy-to-use online tool allows you personally create your bracelets quickly and easily. If you need help, our customer service representatives are standing by to help you with marketing expertise and quality design services. You can count on AmazingWristbands.com for high quality silicone products and exceptional service. Rush delivery of your custom wristbands is available! Create Your Own Custom Wristbands with Our Online Tool! 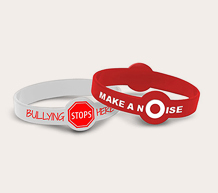 Choose your wristband type, colors, fonts, artwork and custom message with our online builders. Add your own logo and use your brand or cause's colors for your bands. For most of our personalized bracelet styles, you can also add special effects such as glitter and glow, as well as swirl and segmented colors. With our real-time wristband preview, you can see how your custom-made wristband will look as you build it. Our online builders will allow you to quickly duplicate a previous design to make change or order multiple colors of the same design. 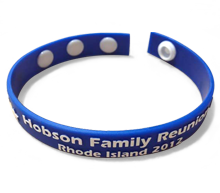 100% Silicone Wristbands - always non-allergenic and latex free! Quality products to help you boost your brand and get your message out! Get started building your wristband today! The only limit is your imagination. Give us a call if you need any help creating your bracelets at 1-800-269-0910. Our friendly customer service representatives are available to help you create and finalize your order. We're looking forward to working with you! *Request a quote and we will get back to you as soon as we can, based on our business hours. You will probably hear from us within 24 hours, but don't be surprised if we get back to you within a few minutes. **Standard production time plus delivery time for orders less than 10,000 pieces is 10-12 business days, Monday - Friday.